Meet the Druid: Nine Traits of a Druid Part 1 | Spell Hub. Brining the occult to life. Breathe deeply and take a look around your settings. Are there any spiderwebs? Maybe you can see trees or plants through a window, maybe your own potted plants? Wave to the imaginary spiders in the spiderwebs. Say hello to your plants or trees around you. That was your first step into druidry and fitting it into your daily schedule. If it felt mundane to you… good! We are mundane. Look at the world around us, take a moment to think of how the universe works and operates to keep everything moving. Think of the vibrations put off by every single piece of matter. We should feel mundane by comparison. Take these moments to be in sheer awe of our neighbors, human and otherwise. While you maintain your life through organization, self-sufficiency and co-existing within society, following the path of druidry allows you to live a life of myth that is supported by new dimensions, beings and energy. 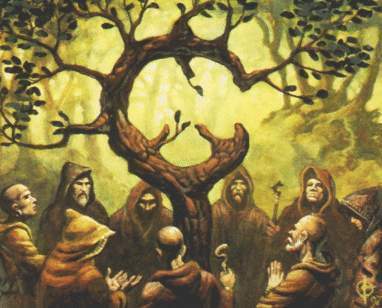 If you think being a druid requires sage-like wisdom, a beard and all the time in the world to connect with nature, then examine the nine traits of a common druid. Druids live lightheartedly. They don’t ever take themselves too seriously and instead prefer to approach life happily and humbly. There are no airs of superiority or arrogance. Rather, a druid enjoys being mild and maintaining a balanced perspective in all matters – both magical and mundane. Druids love humor. Even if something is important or serious, they can step back enough to have a laugh at it. When the situation calls for the appropriate attitude, they show their compassion and empathy. However they know when to be childlike and enjoy themselves. Even if their magic blows up in their face, they can use their sense of humor to put everything back into perspective. Druids enjoy flexibility. Nature never stagnates. It’s always changing and adapting. To a druid, never changing is the best way to halt all progress of life. Druids are constantly expanding and developing their practice as appropriate. Even if their evolving efforts include mistakes, they learn from it and continue moving forward. Druids welcome questions. Their whole journey is experiential. What they learn and discover, they share freely. A druid may not divulge their work or explain themselves to every person, but when someone is genuinely interested in what they do, they’re happy to discuss druidry. Druids do appreciate boundaries and privacy so that they can practice in peace, but they don’t keep secrets from people who will listen. Druids revere nature. They don’t worship nature. The mentality is that we are part of nature, yet we don’t worship ourselves. To a druid, revering nature means have a deep, respectful relationship with the natural world. Everything contains energy of divine nature and druids just want to form connections with that energy. They aren’t so foolish, however, to believe their intentions will keep them safe. If a druid wants to engage nature in the winter, that druid will bring all the provisions necessary to survive the encounter. Druids thrive on integrity. Druids do not behave as other people do. Most people will agree to do something and then offer apologies and excuses when they don’t follow through. Druids take great care in what they do and do not agree to because they never want their word to be broken. If they can’t do something, they will tell you upfront. If they say something will get done, it will get done. Their integrity comes before all else because a reputation and self-image is vital to a druid. A majority of their path lies within their minds, meaning a druid can never allow self-delusion to creep in. Keeping a tight hold on their integrity prevents any misconceptions. Tomorrow we will hit the final three traits of the common druid. While the traits on this list have been largely part of our ideal human condition, the upcoming three have proven to be unique in keeping druidry alive down to this day.